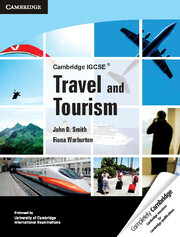 Cambridge IGCSE Travel and Tourism has been written specifically for the Cambridge IGCSE Travel and Tourism syllabus. Sections have been split into units, each dealing with a particular topic, and are cross-referenced to other units wherever appropriate. This new title contains a wide variety of activities and questions to check and facilitate students' understanding, as well as case studies and illustrative examples encouraging subject-based knowledge and a truly international approach. The book is endorsed by University of Cambridge International Examinations. Based on and full coverage of the latest IGCSE Travel and Tourism syllabus. Full colour, attractive design and layout to enrich the learning experience. Sections have been split into units, each dealing with a particular topic, and are cross-referenced to other units wherever appropriate. Clear and detailed explanations of all concepts using diagrams, flowcharts, contemporary photographs and examples as appropriate. Wide variety of activities and end of unit questions to check and facilitate students’ understanding. Contains case studies and illustrative examples encouraging subject-based knowledge as well as a truly international approach.